AIIMS PG entrance exam is conducted twice a year for admission to various MD/MS PG courses. 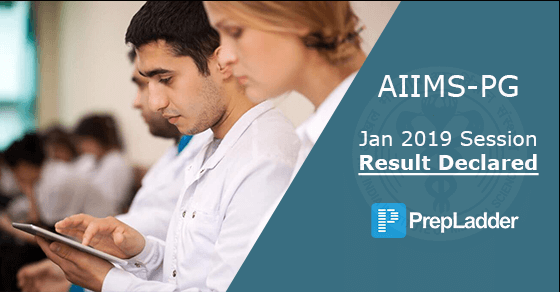 The result for AIIMS PG exam for January 2019 session, which was held on 18th November 2018, has been declared. Merit list of the candidates has been released who have scored above 50 percentile which is the qualifying cut-off criteria. Click here for merit list of AIIMS PG January 2019 session Rank wise. The minimum cut-off score required in the AIIMS PG Entrance, for deciding the eligibility of admission is 50th Percentile. Candidates who have obtained higher aggregate marks in the MBBS Professional Examination will be placed higher than the candidates who obtained lower aggregate marks in the MBBS Professional Examinations. In case the tie still remains unresolved after applying the Step-I, the older candidate (according to date of birth) will be given preference over the younger one. 49.5% of total MD/MS seats are reserved (excluding Sponsored/ Foreign National candidates) for the candidates who belong to the SC, ST and OBC (Non-creamy layer) category. Those who have graduated from All India Institute of Medical Sciences, New Delhi shall be preferred for admission against 50% of the total MBBS seats of AIIMS of the open general seats without any discipline wise preference. Applicable to medical graduates of AIIMS New Delhi only for PG seats of AIIMS, New Delhi. Any seat left vacant out of the AIIMS preferential seats or any other reserved seats shall be available to other open general category candidates in order of merit. All those who could not qualify AIIMS PG January 2019 session, don’t get disheartened, gear up for upcoming exams.